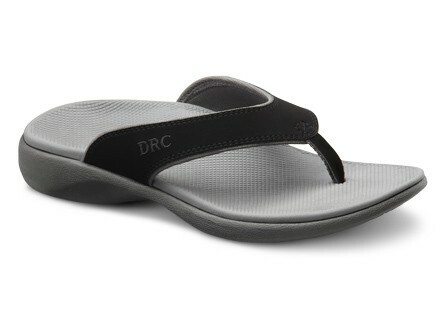 With the weather warming up the tendency on The Central Coast is to go around in thongs. Whilst thongs certainly do have their usefulness, if you wear them for long periods on hard surfaces they can increase your chance of developing painful conditions such as plantar fasciitis (heel pain), flare up painful joints like knees and hips or even the lumbar spine. Low heeled flat thongs also increase your chances of developing dry and cracked heels through drying out and over-pronation (flat foot). The best advice is to wear a well fitted shoe when spending long periods standing on hard surfaces and the use of thongs should be restricted to times where you are too and from the beach or the pool or for martial arts and gyms for hygiene purposes. However, inevitably we tend to find ourselves wearing thongs for longer than we intended e.g. around a barbeque, or heading to the shops after the beach. So if thongs are to be worn they may as well have some decent properties. I recommend looking for thongs with a mild heel elevation – about 1cm is perfect. This means that the heel will be slightly higher than the toes. This simple property will mean the foot will have to compensate and flatten out less as a result of tight calves that will restrict the ankle bending. Having tight calf muscles is extremely common as most of us have to sit down for work or transport or wear shoes that are very high heeled which can cause shortening of the calves. The other factor in choosing a thong is to look for a mild arch support. Whilst most thongs will have an arch much lower than our own, it is still beneficial to have this support as it can help keep the foot out of its end range of foot collapse. The above advice is generalised in nature and there are people with lower limb conditions that should never wear any type of thongs. If you are in foot pain or are unsure about your mechanics you should ask your podiatrist.